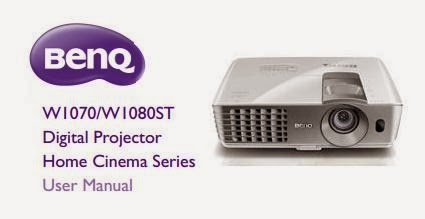 The BenQ W1070 Projector manual is available now. The manual comes in pdf format and available in english language. 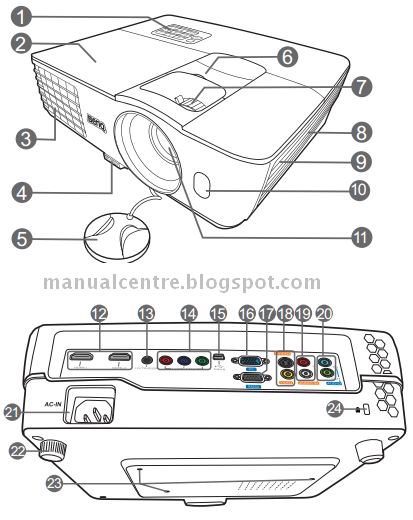 This pdf manual also for BenQ WI080ST Projector. The BenQ W1070 Projector has physical dimensions of 10 x 31 x 24 with weight are 2.6 kg. This projector support Full HD 3D with Compatibility like HDTV:720p, 1080i, 1080p/60 576i, 576p. Other main specs and features of this projector such as 2000 ANSI, 1920x1080 Pixels, 10.0 W Mono speakers, 15.0 - 102.0kHz H-Sync Range, 23 - 120Hz V-Sync Range. This Projector price at $1,099 (USD). television (EDTV) 480p, 576p and High Definition TV (HDTV) 720p, 1080i/p 60Hz formats, with the 1080p format providing a true 1:1 image reproduction. The projector provides excellent picture quality due to its high resolution, excellent home theater brightness, high contrast ratio, vivid color and rich gray-scale reproduction. The projector features super high brightness to achieve excellent picture quality in ambient light conditions, outperforming ordinary projectors. The projector features a 6-segment color wheel to produce realistic color depth and range unattainable with lesser segment color wheels. When viewed in a darkened environment, the automatic gamma control provides excellent gray-scale display which reveals details in shadows and in night or darkened scenes. The projector supports a wide variety of inputs for connection to your video and PC equipment, including component video, S-Video, and composite video, as well as dual HDMI, PC, and an output trigger for connection to automated screen and environment lighting systems. To reach a higher standard of performance, the projector incorporates ISF NIGHT and ISF DAY mode settings in its OSD menus, which requires professional calibration service from authorized ISF installers. To enjoy the 3D movies, videos, and sporting events in a more realistic way by presenting the depth of the images through HDMI. Built-in speaker(s) providing mixed mono audio when an audio input is connected. The intuitive control over lens shift lever provides flexibility in setting-up your projector. The short throw ratio projection provides 1080p picture quality with shorter projection distance. SmartEco technology saves lamp power consumption up to 70% depending on the content brightness level when SmartEco mode is selected. 12VDC output terminal Used to trigger external devices such as an electric screen or light control, etc. Consult your dealer for how to connect these devices. RS-232 control port Used to interface with a PC or home theater control/automation system. Focus ring: Adjusts the focus of the projected image. Zoom ring: Adjusts the size of the image. POWER indicator light: Lights up or flashes when the projector is under operation. MENU/EXIT: Turns on the On-Screen Display (OSD) menu. Goes back to previous OSD menu, exits and saves menu settings. POWER: Toggles the projector between standby mode and on. ECO BLANK: Used to blank the screen picture. TEMPerature warning light: Lights up red if the projector's temperature becomes too high. LAMP indicator light: Indicates the status of the lamp. Lights up or flashes when the lamp has developed a problem. AUTO: Automatically determines the best picture timings for the displayed image. Keystone/Arrow keys ( / Up, / Down) Manually corrects distorted images resulting from an angled projection. Right/Increases the projector volume. When the On-Screen Display (OSD) menu is activated, the #7, #12, and #13 keys are used as directional arrows to select the desired menu items and to make adjustments. 14.MODE/ENTER: Selects an available picture setup mode. Activates the selected On-Screen Display (OSD) menu item. The BenQ W1070 Projector user manual consisting of 61 pages. 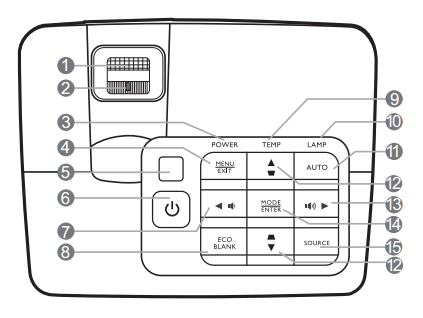 This manual contain many reference information such as about Replacing the remote control batteries, Projector features, Controls and functions, Obtaining a preferred projected, connecting HDMI devices, connecting a computer, tutorial Turning the projector on, using the menus, Securing the projector, Using the preset and user modes, Operating in a high altitude environment, Personalizing the projector menu display, Locking control keys, On-Screen Display (OSD) menus, Care of the projector, safety and troubleshooting problem, and more.